For some reason I had resisted making panzanella salad despite reading so many good recipes for it. I just thought it couldn’t be that good – it’s just veggies and bread, right? Wrong! It’s really the perfect salad – light, fresh, salty, crunchy. Without any pesky greens getting in the way (let’s just be real here). I was inspired to finally make this summer panzanella salad when I couldn’t bear the thought of turning on the oven and needed an easy work week lunch. This exceeded my expectations completely and I actually can’t stop eating it. 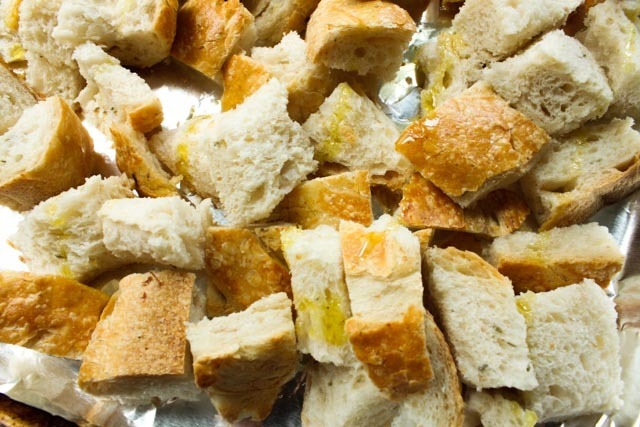 Start by making the panzanella croutons. These are crucial to a perfect panzanella. No store-bought/bagged croutons need apply. You’ve got to make your own for this recipe and it couldn’t be easier. 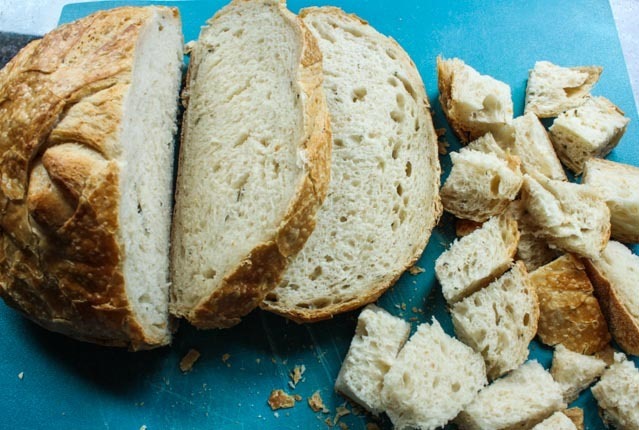 Slice up the entire loaf into 1″ cubes. Spread the cubes out on to a tinfoil lined baking sheet and drizzle with 1 tbsp. of EVOO. 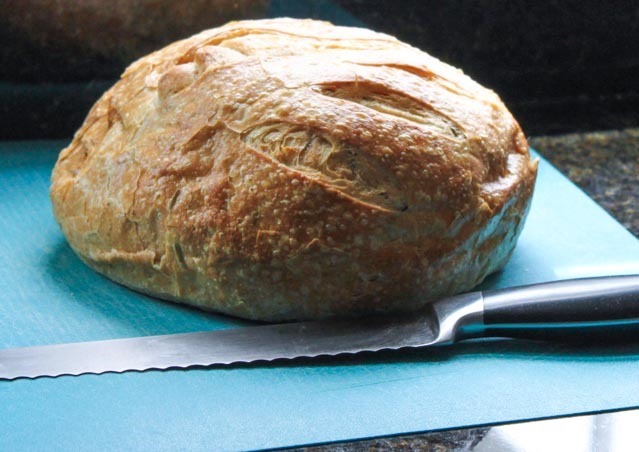 Bake on 350 degrees for 15-20 minutes until brown and crunchy. When they are done baking, cool completely. 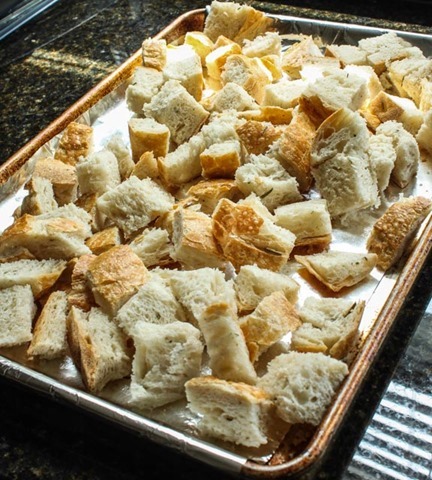 These croutons can be stored in a ziptop bag in the fridge for 1 week. 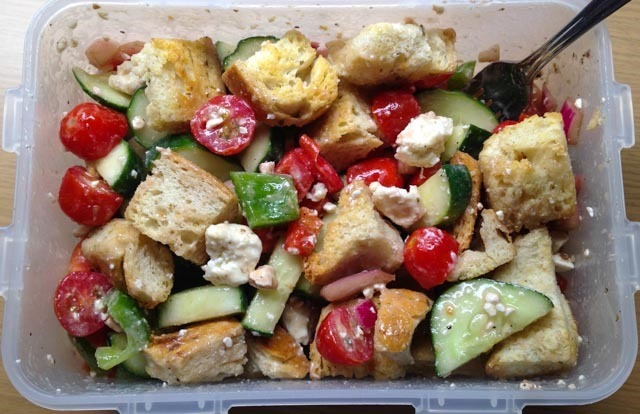 It’s ok if they get a little stale – that’s what panzanella is based on anyway! 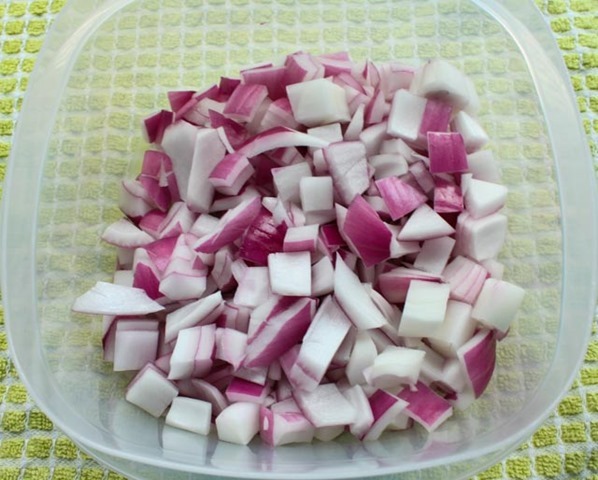 While the croutons are baking, marinate the onion. 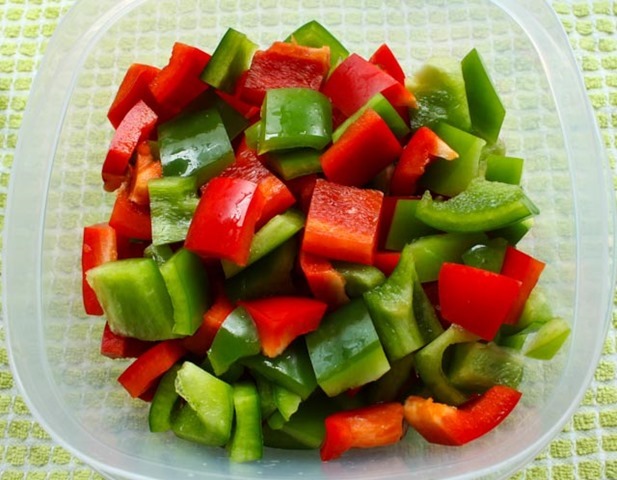 Chop and toss in a tupperware container with the remaining tbsp. of EVOO and balsamic vinegar. 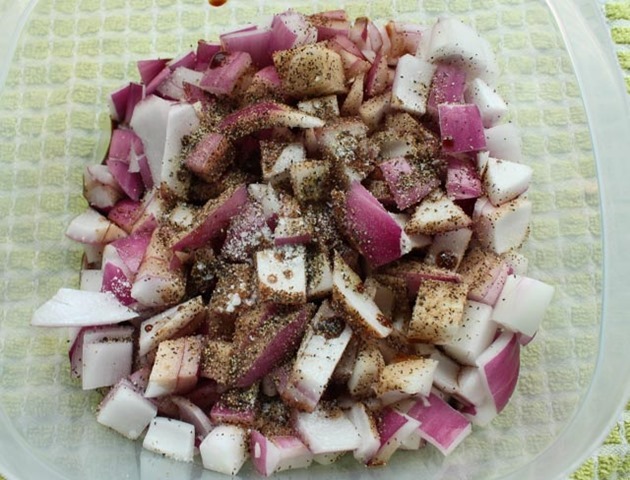 Top with a little salt and pepper, put the lid on, give a good shake, and let the onions marinate for at least 6 hours. These will keep for 1 week in a tupperware container in the fridge as well. Next, chop the rest of the veggies and store in tupperware containers. 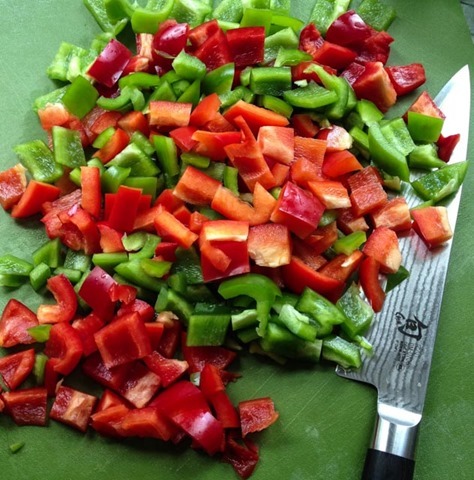 I cut my peppers in advance and chop the cucumber and tomatoes day of. You can do whichever you prefer. This salad comes together so easily, which is why I prepped it all in advance and made it every day as my work lunch. Just take 1/5 of each ingredient (peppers, onions, cucumber, tomatoes, and feta), toss together in a tupperware container, and add the croutons and salad dressing right before you are about to eat. The croutons are crunchy and addictive, the veggies are fresh and light, the feta is perfectly salty, and the dressing gets soaked up by everything. It’s so good! This will definitely be a staple in the work week lunch rotation for a long time. That looks good, but I find when I don’t have protein in my lunch I’m starving shortly after. Do you find this filling enough? I agree. With this, it’s filling for at least 2 hours. I always have a snack around 3ish regardless though. Sweet. Maybe I’ll give it a try! The best bread salad I have ever had is the fattoush salad from cafe barrada in north cambridge. Get it w. grilled chicken and a side of hummus.